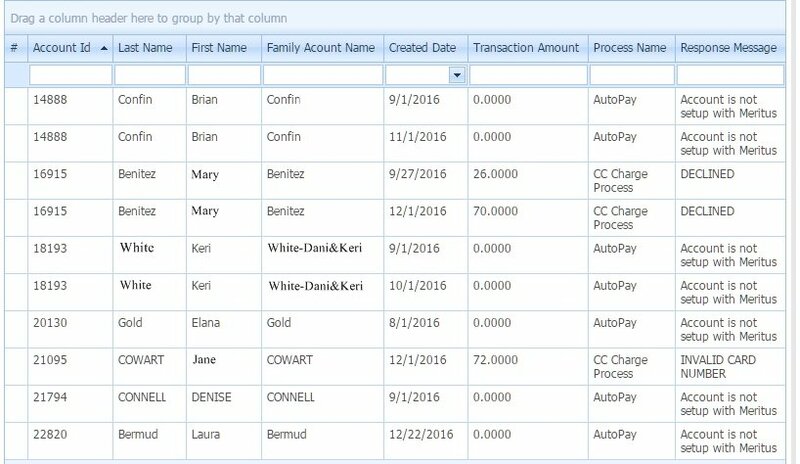 The Recurring Error Report will show every time an Autopay process attempted to be performed and the reason it failed. In order to see this report, you must have Autopay turned on. This must be requested to CompuDance. After you have Autopayments process you can view this Report in Billing -> View Recurring Error. Here is an example of the report. You can group , filter and sort this report. There are different error reasons that may be posted. Account is Not Setup with Merritus means there is no payment account saved on file for the family. DECLINED is the Credit Card company declined the payment. INVALID CARD NUMBER means the card information on file does not exist. blank is shown for an ACH process. Keep in mind ACH can be reversed like a check for Insufficient Funds up to 7 days after the approval. If this occurs you will be notified by the payment processor. You will have to make changes in CompuDance of the reversal.